Edgar Mueller Archives - Joe.My.God. 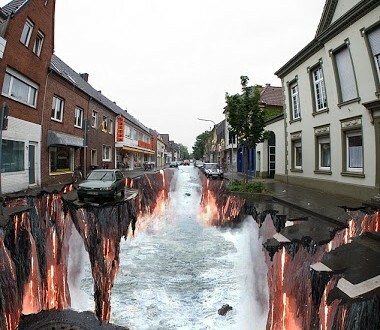 This is actually a giant optical illusion painting by German artist Edgar Mueller, who paints what appears to be a 3D image directly onto a street surface. Drivers and pedestrians swerve to avoid “falling in.” More examples of Mueller’s work at the link, including a video of how it’s done.